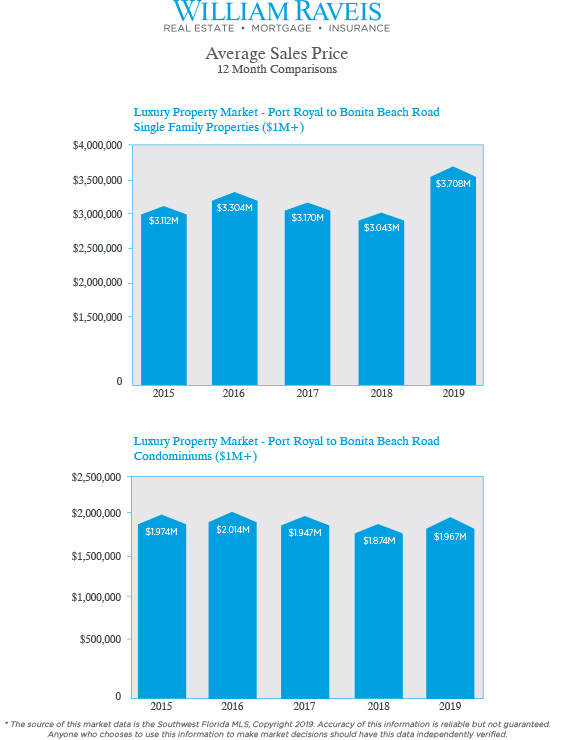 The number of closed sales in the 12 months ending January 31, 2019 for the luxury market from Port Royal to Bonita Beach Road area improved 11% year-over-year (373 vs 337). During the 12 months ending January 31, 2019, a total of 658 new listings were added to the market, this is approximately 4% more listings than the same time period 12 months ending January 31, 2018. Available inventory as of January 31, 2019 consisted of 468 units, an increase of 1% vs the same time period in 2018. Current inventory represents 15 months of supply based on current absorption rates. The year-over-year average sales price for the area was $3,707,500, which increased 22% vs the same time period in 2018. The median sales price for the area increased 51% to $3,000,000 vs 2018. 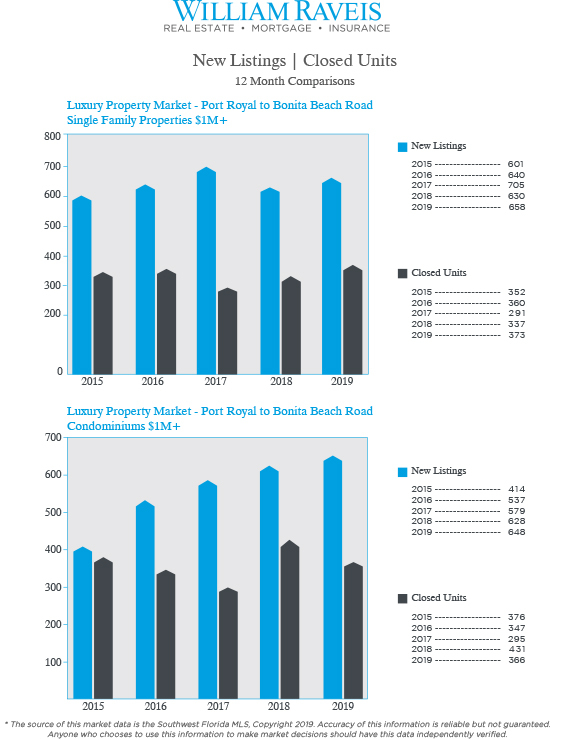 The number of closed sales in the 12 months ending January 31, 2019 for the luxury market from Port Royal to Bonita Beach Road area decreased 15% year-over-year (366 vs 431). During the 12 months ending January 31, 2019, a total of 648 new listings were added to the market, an increase of approximately 3% vs the same time period, 12 months ending January 31, 2018. Available inventory as of January 31, 2019 consisted of 430 units, an increase of 13% vs the same time period in 2018. Current inventory represents 14 months of supply based on current absorption rates. The year-over-year average sales price for the area was $1,966,589, an increase of 5% vs the same time period in 2018. The median sales price for the area increased 11% to $1,950,000 vs 2018.